In what could be the college sports story of the year, former Wake Forest assistant football coach and IMG radio announcer Tommy Elrod has been accused of providing “confidential and proprietary game preparations” to multiple opponents of Wake Forest since 2014. A former quarterback for the Deacons from 1993-1997 and assistant from 2003-2014, Elrod wasn’t retained by current head coach Dave Clawson when he took office prior to the 2014 season. Despite this, authorities have found no motive for Elrod’s actions at it stands. Elrod has been immediately fired from IMG and banned from Wake Forest athletics and facilities. The university has no further comment on the matter at this time. The accusation came on the back an investigation that began after previously unused offensive plays were found in Louisville’s Papa John’s Cardinal stadium before their game against Wake Forest on Nov. 12. Records of text messages, emails and phone records have led the investigation to Elrod, while no other player, coach or member of athletic communications has been tied to the leaks in any way. A recent press release issued from the Wake Forest Athletic Communications department summarizing the findings of the investigation includes statements from both athletic director Ron Wellman and Dave Clawson. Clawson echoed a similar sentiment. 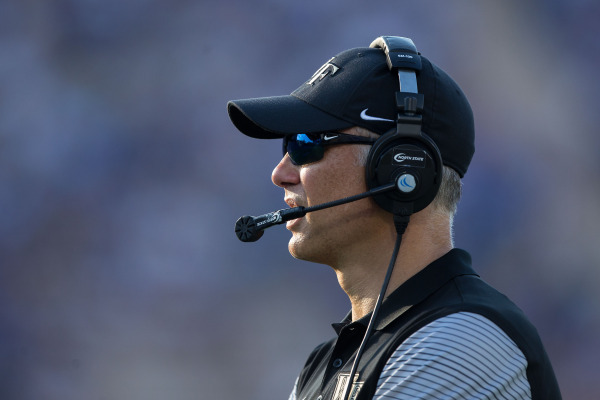 Wellman, Clawson and the entirety of the Wake Forest football program are currently focused on preparing for their upcoming matchup against No. 23 Temple in the Military Bowl on Dec. 27, which will be Wake Forest’s first bowl game since 2011. The Old Gold & Black will continue to update this story as more information is released. The Old Gold & Black spoke with former wide receiver Matt James earlier today regarding the current situation surrounding the “confidential and proprietary” information that was given to Louisville and Army since 2014, apparently through former Wake Forest assistant coach and radio analyst Tommy Elrod. James, who played wide receiver for the Demon Deacons from 2010-2014, played under both Elrod and current head coach Dave Clawson, who didn’t retain Elrod and multiple other members of the incumbent coaching staff when he took office before the 2014 season. There are more questions surrounding this story than answers, and as it stands right now, James and other former players are in disbelief. James, like many Wake Forest fans and those formerly involved with the program, are seeking more information and facts before coming to conclusions. With Louisville and the ACC both releasing statements today, the situation has become somewhat clearer regarding the number of teams potentially implicated in the scandal, but the amount of gray area still remaining in what twitter has dubbed “wakeylinks” is enough to conjure up conspiracy theories for days. Wake Forest has said that they have contacted all relevant teams and proper authorities. What we do know is that Louisville took the information from Elrod, although they say they did not use it to their benefit. Army has also stated that they were contacted by Elrod, but has not stated that they used said information. Clemson and N.C. State have said they have not been contacted by Wake Forest regarding the situation. The Wake Forest football season officially ended on Dec. 27, but #Wakeyleaks is still playing out across national media. The Courier-Journal reported on Feb. 13 that phone records show Elrod initiated the conversation with Galloway through a phone call the week of the Wake Forest-Louisville game on Nov. 12, and text records show that the two arranged to meet the night before the game. At the time of the alleged meeting, however, the loose and compromised plays had already been discovered in Papa John’s Cardinal Stadium by a Wake Forest equipment manager. Galloway was suspended for the Citrus Bowl, Louisville’s bowl game, and has not received further reprimands. Virginia Tech and Army, the other two schools that received plays and confidential information, have both fined the coaches involved $25,000.